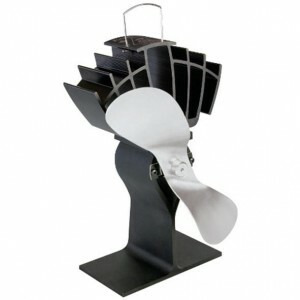 The Ecofan™ is a heat powered fan designed to circulate the warm air created by a wood or gas stove. These fans do not use any batteries or mains power. These fans have a thermoelectric module which acts as a small generator to power the fan’s motor. When this generator module experiences a heat differential between its top and bottom surfaces, it pumps out electricity. The base of the fan heats the bottom surface of the module, while the top of the module is kept cooler by the fan’s top cooling fins. Warm air is circulated directly into the living area rather than have most of the stove’s heat rise immediately to the ceiling, thereby increasing the heating effectiveness of the stove. Improved warm air circulation results in greater comfort and less fuel consumption. Many people use Ecofan to help combat dry air by positioning the Ecofan behind a tray of water on the stove top, to boost the rate of evaporation. The Ecofan starts automatically and adjusts its speed with the stove temperature. As the stove heats up, the Ecofan runs faster to move more warm air into the room. As the stove cools, the Ecofan automatically shuts off. Ecofan costs nothing to operate. Using only the heat from the stove, the Ecofan is the most economical way to effectively circulate warm air. It does not plug in, uses no batteries and can be used where there is no electricity. The unique blade has been specifically designed to deliver a very broad cross section of gentle air movement, instead of a small cone of concentrated air. The generator module is a unique semiconductor device that relies upon the Seebeck effect to generate electricity. When two dissimilar semiconductors (p-type and ntype) at the same temperature are connected together they establish a static electric potential difference. With the introduction of a temperature difference heat flows across the joined semiconductors which in turn permits electrons to flow. With the electron flow or current comes the ability to power electrical devices such as the fan’s motor.